GOKPOP | Exclusive K-News in Malaysia & Singapore: SneakerLAH, Malaysia's Biggest Sneaker Event is Back! SneakerLAH, Malaysia's Biggest Sneaker Event is Back! Malaysia’s biggest and most anticipated sneaker event is back with its third installment offering sneakerheads, streetwear enthusiasts, collectors and traders an opportunity to congregate under one roof to buy, sell, trade, and share the passion of anything and everything sneakers-related. SneakerLAH first started out in 2015 as a small passion project between a bunch of friends that was immediately welcomed by the sneaker scene with open arms, scoring an attendance of about 17,000 event goers for that year, and 22,000 the following year. 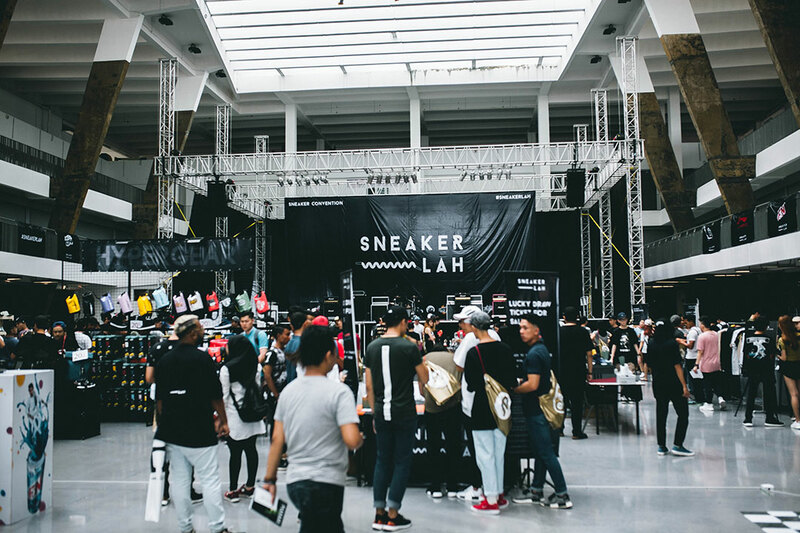 This year, #SneakerLAH2017 will be held in KL Convention Centre on the 7th & 8th October with a venue space of 28,000sqf, making this year the biggest one yet. 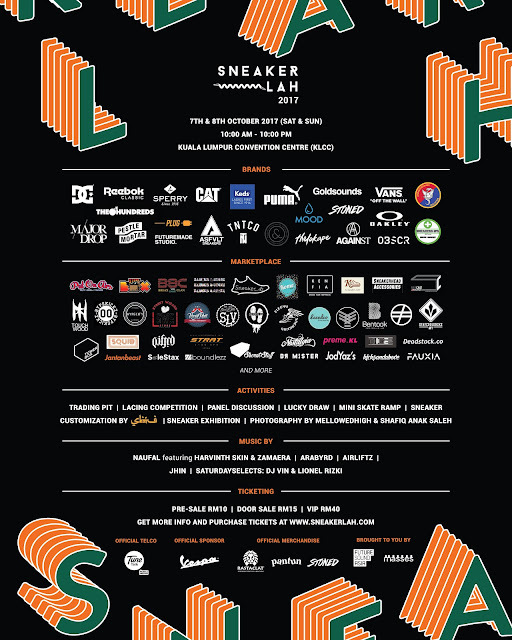 Expect a host of activities covering aspects of sneaker culture, streetwear/fashion, lifestyle, music and more at this year’s SneakerLAH – including an extensive display of over 350pairs of limited edition sneakers and an indoor mini ramp for skate enthusiasts to enjoy. Attendees can also find out about upcoming releases from international brands like Vans, Reebok, and Rastaclat, all of which and more will have a presence at SneakerLAH for attendees to check out. At the SneakerLAH marketplace, which is one of the biggest draws of the event, attendees can buy, sell & trade the hottest sneakers on the market right now with more than 50 sneaker-related vendors; all of this will be happening to a soundtrack of cool beats and performances from KL’s hottest artists like Airliftz, Zamaera, DJs Arabyrd, JHin and more. Other activities to also take note of is the sneaker lacing competition, a Vans sneaker customization station by the world-renowned sneaker customizer SBTG, a trading pit for attendees totrade sneakers with each other, andpanel discussions with industry personalities and opinion leaders such as Daniel Kasidi (founder ofRastaclat), the aforementioned SBTG, Nelson Tan from Sole What and more. Attendees are also encouraged to come decked out in their freshest gear, as SneakerLAH will feature famed lifestyle photographers Anton Lim (@MellowedHigh) from Singapore & Shafiq Saleh (@shafiqanaksaleh) asofficial event photographers. #Sneakerlah2017 is a ticketed event with pre-sale tickets available at RM10, door sale tickets at RM15 andVIP tickets at RM40 which allow VIP attendees exclusive early entry to the event anhour before the event starts to grab the best deals. With each ticket purchased, attendees are eligible to win sneakers and other prizes in the lucky draw. Tune Talk is the Official Telco of Sneakerlah 2017and Tune Talk customers can expect special privileges atthe event, such as designated entry lanes and more. Vespa isan Official Sponsor and there will be 2 x Vespa S 125up for grabs at the lucky draw. Sneakerlah will also be collaborating with Rastaclat, Stoned & Co. and Pantun Pins to produce official Sneakerlah merchandise which will be available for purchase at the event. Venue: Hall 6, KL Convention Centre, Kuala Lumpur.